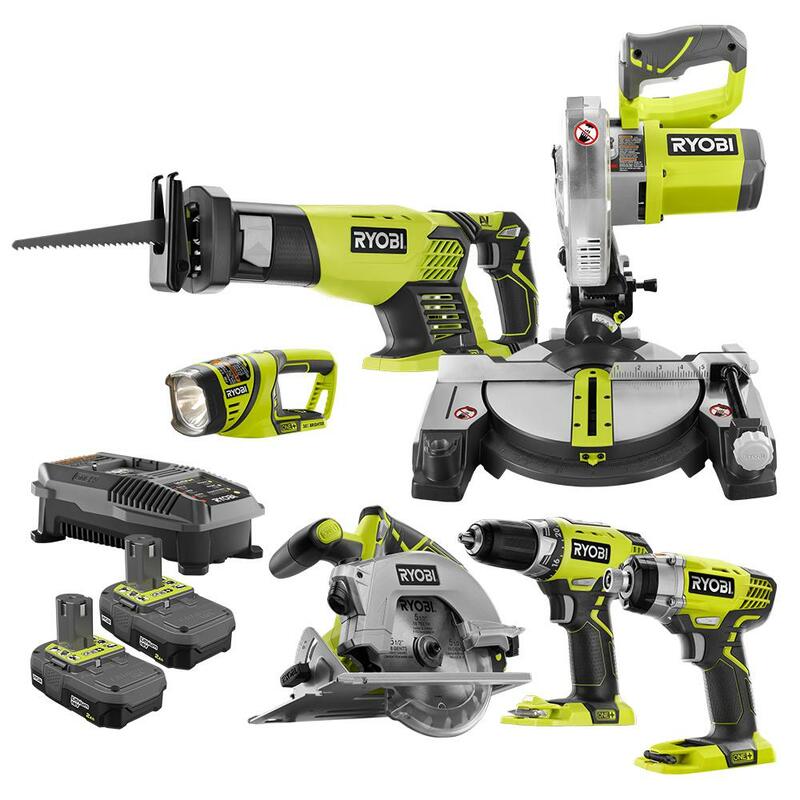 RYOBI introduces the 18-Volt ONE+ Lithium-Ion Cordless 6-Tool Combo Kit with (2) 2.0 Ah Batteries and (1) 18-Volt Dual Chemistry Charger. This kit provides a variety of tools to get all of your projects done. The 2.0 Ah lithium-ion batteries that are included provide over 1.5X runtime and are compatible with over 125+ 18-Volt ONE+ tools. Backed by the RYOBI 3-Year Manufacturer's Warranty, this RYOBI 18-Volt combo kit includes Cordless Miter Saw, Impact Driver, Drill, 7-1/4 in. Circular Saw, Reciprocating Saw, Flashlight, two 2.0 Ah batteries, an 18-volt dual chemistry charger, and an operator's manual. Miter saw: Compact and lightweight with up to 2 in. x 4 in. cutting capacities and 4-1/4 in. cross cut capacity. Welcome to our store, your number one source for quality products with better pricing. We're dedicated to giving you the best customer online shopping experience with an excellent and high customer service standard. We hope you enjoy our products as much as we enjoy offering them to you. If you have any questions or comments, please don't hesitate to contact us.